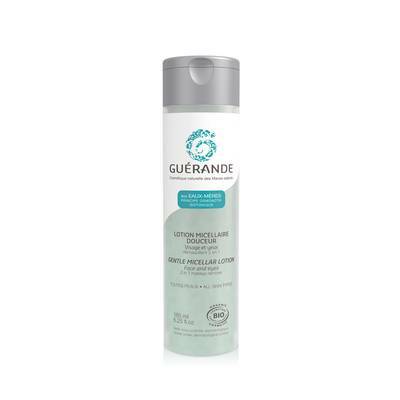 Guérande micellar lotion cleanses and removes make-up, while remineralizing and softening the skin. The skin is left healthy, fresh and soft, more receptive to the action of your day & night face cream. Aqua (Water), Ascophyllum Nodosum Extract*, Maris Aqua (Sea Water), Caprylyl/capryl Glucoside, Gluconolactone, Salicornia Herbacea Extract*, Sodium Benzoate, Alcohol**, Sodium Hydroxide, Parfum (Fragrance), Polyglyceryl-5 Oleate, Sodium Cocoyl Glutamate, Tetrasodium Glutamate Diacetate, Benzyl Alcohol, Apricot Kernel Oil Polyglyceryl-6 Esters, Limonene, Glyceryl Caprylate, Linalool, Citric Acid, Dehydroacetic Acid, Calcium Gluconate, Citronellol, Cocos Nucifera (Coconut) Oil, CI 75810 (Chlorophyllin-copper Complex), Ascorbyl Palmitate, Tocopherol.